During the late nineteenth century, immigration to the United States from East Asia, particularly China, saw a massive influx, much to the surprise and eventual dismay to the American white population. For a population that were also inherently immigrants, built on the foundations of native population extermination before and after independence from the British, their indignation could be seen as quite hypocritical and in some sense, ironic. At the time, the Chinese were seen as a threat to ordinary, hard-working US citizens and “overlapped with domestic fears about American race, class, and gender relations and helped fan the fires of organized anti-Chinese sentiment … Chinese workers were blamed for competing unfairly with white workers. Chinese as a race were charged with being inassimilable, inferior, and immoral” (Lee, 2007, pp. 546-547). Different states had different laws regarding the Chinese, and it is important to realise that at this time racism was rife in the country with the black population facing the brunt. In 1854, the State of California recategorised the Chinese to the same level as black and Native Americans, which meant that they did not have the right to testify against a white man in a court of law (Bancroft, 2005). 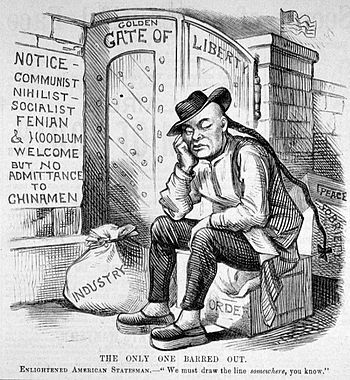 In 1882, the infamous Chinese Exclusion Act was passed, country-wide, which severely prohibited the movement of Chinese citizens to the US, a law which was only repealed in 1943. As all this went on in the foreground, there was other events taking place in the background. Seemingly at odds with the official stance of the US being “anti-Chinese”, there was however a few openings on the education front. Hsu (2014), in her work on educational exchange during this period of exclusionary policies, highlights what she calls a “counter-narrative” (p. 315) to the prevailing view of this time. She writes that “… even in the depths of restrictive fervor, Chinese students—seen as a leadership class that eventually shaped the future of modern China—were not only welcomed in the United States, but funded and protected by powerful American and Chinese interests”. Previous historical circumstances had made China wary of foreign influence, encapsulated by the “Boxer Rebellion”, a strong backlash against western Christian missionaries and foreigners in general. (At the time, China was the predominant country for US missionary work). In the Qing dynasty, there were worries that students sent abroad would become “denationalized” and China would see no benefit (Hsu, 2014, p. 319). Through the creation of the China Institute, however, the US saw a climb in foreign students from China, as well as an acceptance that China would face an inevitable decline if they did not attempt to familiarise themselves with Western education. Even during the height of exclusion, Chinese students made “were among the most numerous of foreign students on U.S. campuses” and such a exchange managed to persuade “Americans not only to invest in positive experiences of the United States for Chinese, but also to rethink racialist ideologies of exclusion against Asians.” (Hsu, 2014, p. 322). 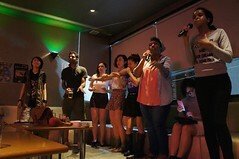 In essence, student exchange helped to counter-balance xenophobic attitudes towards China. The Cold War threatened to undo most of these relations, however, with a communist China considered a threat. Plus that to today, with increasingly paranoid US afraid of losing their Number 1 status, economically and politically, could there be similar sentiments rising? This video echoes of the late nineteenth century. And the US currently operate an anti-Chinese exclusion policy for NASA, and do not forget the Huawei “national security concerns” story. Will more Chinese students studying in the US help to ease tensions, or have times changed too much? Bancroft. (2005). ‘Anti-Chinese Movement and Chinese Exclusion’, Bancroft Library, The Regents of University of California. Retrieved from http://bancroft.berkeley.edu/collections/chineseinca/antichinese.html on 8 June 2014. Hsu, M, Y. (2014). Chinese and American Collaborations through Educational Exchange during the Era of Exclusion, 1872–1955, Pacific Historical Review, Vol. 83, No 2, pp. 314-332. Retrieved from http://www.jstor.org/stable/10.1525/phr.2014.83.2.314 on 8 June 2014. Lee, E. (2007). The “Yellow Peril” and Asian Exclusion in the Americas, Pacific Historical Review, Vol. 76, No. 4, pp. 537-562. Retrieved from http://www.jstor.org/stable/10.1525/phr.2007.76.4.537 on 8 June 2014. This entry was posted in International Migration and tagged California, china, Chinese, Chinese Exclusion Act, discrimination, ethnicity, migration, Pacific Historical Review, prejudice, race, racism, Sinophobia, united states. Bookmark the permalink.